This article is about the section of U.S. Route 29 in Virginia. For the entire route, see U.S. Route 29. Since 1928, when Virginia General Assembly passed Senate Bill 64, much of US 29 in Virginia is known as the Seminole Trail. Through Northern Virginia, it is known as Lee Highway, except in Falls Church, where it acts as the east/west divider for city streets and is called North or South Washington Street. On April 7, 1993 the Virginia General Assembly officially designated the entire length of US 29 from the North Carolina border to the Potomac River as the "29th Infantry Division Memorial Highway" in honor of that Army unit, which, along with the 1st Infantry Division, formed the spearhead of the American infantry that landed on the morning of 6 June 1944 on Omaha Beach in Normandy as part of the invasion of France to liberate that country during World War II. These divisions next fought their way across France, and into Germany. In addition, the name of this highway serves to honor many members of the Virginia Army National Guard who serve as part of this National Guard Division today. Signs indicating this designation have been placed periodically on both sides of US 29. For most of its route through Virginia, US 29 has been constructed to be at least four lanes along its route, with the two short exceptions being where the highway passes through Manassas National Battlefield Park, where it is two lanes wide for approximately three miles, and through Fairfax and Arlington counties, where it is sometimes wider. US 29 entering Virginia from North Carolina; The Bus/Byp split, Bus. entering, and Byp. entering. US 29 in Virginia has eleven highway by-pass routes around various cities and towns. These bypasses are around Danville, Chatham, Gretna, Hurt-Altavista, Lynchburg-Madison Heights-Amherst, Lovingston, Charlottesville, Madison, Culpeper, Remington, and Warrenton. In addition, Interstate 66 serves for the most part as a by-pass of Manassas and also Fairfax and Arlington. US 29 enters Virginia in Danville from North Carolina, immediately splitting into business and by-pass routes. US 29 joins the Danville Expressway and US 58 around the east side of Danville, entering Pittsylvania County, and re-merging with the business route north of town in Blairs. The interchange where the split of US 29 into Business and Bypass routes/junction with US 58 occurs has ramps that enter North Carolina and ramps that enter Virginia, complete with welcome signs from each state. There is a cloverleaf ramp that dips into North Carolina from Virginia and then crosses the state lines back into Virginia. Along the southeastern quadrant of the Danville Expressway between the North Carolina US 360, the route is designated as part of unsigned State Route 785 for 7.39 mi (11.89 km). Created c. 2000, SR 785 is numbered in contradiction to the conventional system of numbering in the state, where primary routes are numbered less than 600 and secondary routes at or above this number. It is numbered as such because it is part of the planned Interstate 785, which will run south along US 29 to Interstate 85 in Greensboro, North Carolina, and is only one of two routes of this type. The other is Route 895 in Richmond for similar reasons. US 29 then continues north where it splits into business and by-pass routes for Chatham, Gretna, and Hurt before entering Campbell County. The next major city is Lynchburg. US 29 joins the US 460 by-pass of Lynchburg, splitting from it just before entering Amherst County. US 29 again by-passes Madison Heights and Amherst as an expressway, and enters Nelson County and passes the town of Lovingston and enters into Albemarle County. The route then continues north to Charlottesville, intersecting Interstate 64 and by-passing downtown Charlottesville. US 29 rejoins its congested business route just north of downtown, continuing north as a 6 lane road through Charlottesville's business district. Past Charlottesville, it converts back to 4 lanes and continues through Greene and Madison Counties, and then turns north-east toward Culpeper. US 15 joins US 29 around Culpeper, and heads to Warrenton, entering Northern Virginia. US 29 / 15 is joined by US 17 south of Warrenton in Fauquier County, and continues around the town, with US 17 splitting off. US 29/15 continues mostly eastward to Gainesville where US 15 splits and US 29 intersects Interstate 66 for the first time. US 29 continues into Fairfax County, where it passes along the boundary of the city of Falls Church, where the road has two different names. The portion of the street running northbound is located in the City of Falls Church is called Washington Boulevard, and has different street addresses than the other side running southbound in Fairfax County, where it is named Lee Highway. The road continues into Arlington, having intersected I-66 five more times before crossing into the District. The portion of what is now US 29 from the North Carolina state line to Warrenton was named the Seminole Trail by an act of the Virginia General Assembly on February 16, 1928. Although it was apparently not part of the National Auto Trails initiative early in the 20th century, the Seminole Trail is believed to have originated as part of an effort to promote the road as a through-route to Florida, home of the Native American Seminole tribe. Many road maps of the 1930s and 1940s list the Seminole Trail on highways in Virginia, the Carolinas, Georgia and ultimately Florida. The Gainesville Interchange project took place at the interchange between Lee Highway (US 29) and Interstate 66 at the junction with Linton Hall Road (SR 619) starting in July 2011, with board planning on it dating back to 2006. The project was worth $230 million and included interchanges at many other heavily traveled roads in the area due to the rapid growth in development in Gainesville and Haymarket, along with it being a major area drivers departure off of I-66 to travel towards other major cities along Lee Highway, such as Charlottesville. Reasoning for this is because of the lack of road development to accommodate the new heavy traffic in the area. The plan included a single point interchange design and bridges over train tracks to ease traffic flow on Lee Highway onto I-66. Lee Highway was also widened around the interchange to combat this issue. What was once a two-lane country road is now a four lane suburban highway. Land was acquired by VDOT at the intersection of US 29 and Linton Hall Road/SR 619. The entire project was completed and opened to the general public on July 9, 2015. A western Route 29 bypass around Charlottesville was originally proposed in 1979. Engineering and environmental work on the project began in late 1984 and the location was approved by the Commonwealth Transportation Board in 1990. This bridge carried Route 29 across the Buffalo River until its destruction by Hurricane Camille in 1969. Acquisition of right of way for the project began in 1991 and continued until 2001. No additional right of way has been purchased since then. VDOT owns 36 properties that are currently leased and occupied. In 1998 a lawsuit was filed challenging the project, alleging that the environmental impact review of the project violated the National Environmental Policy Act (NEPA). In 2001 the federal court ruled in favor of VDOT on the suit but required the agency to complete a Supplemental Environmental Impact Statement addressing the road's impacts on the South Fork Rivanna Reservoir and the mitigation to minimize those impacts. That document was completed and accepted by the Federal Highway Administration in 2003. In 1996 the Charlottesville-Albemarle Metropolitan Planning Organization (MPO) inserted language into its Transportation Improvement Program that prevented additional funds from being allocated to construction of the Western Bypass. That language was removed by the MPO Policy Board in July 2011. All activities on the Route 29 Charlottesville Bypass project were suspended in March 2014 following notification from the Federal Highway Administration that a new Supplemental Environmental Impact Statement would be required before the environmental process could be completed. The new Supplemental EIS was required due to the history of litigation and controversy associated with the project. US 29 north (Key Bridge) – Washington Continuation into D.C.
^ "2010 Traffic Data". Virginia Department of Transportation. 2010. Retrieved 2012-01-09. ^ Dave McNair (9 Oct 2006). "Route 29 to become Wahoo Highway?". The Hook. ^ "Odd Fellows Road Interchange and Roadway Improvements" (PowerPoint). Virginia Department of Transportation. VDOT. January 12, 2016. p. 3. Retrieved July 29, 2017. 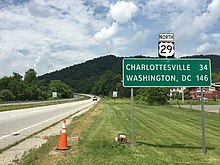 Wikimedia Commons has media related to U.S. Route 29 in Virginia. This page was last edited on 3 April 2019, at 22:00 (UTC).